ReptileAddiction wrote: Whoa! Your supermarket garlic is huge compared to mine. The garlic is a pretty decent size, but it's not huge. Well, oops. Still mine are fairly small compared to your garlic. Blackgoats wrote: Has anyone noticed how difficult it is getting to order garlic and have it shipped. More and more states seem to be prohibiting the movement of bulbs due to diseases being transmitted interstate. I am happy I was able to plant half a pound last Oct and harvested nine pounds the beginning of July. We are having a garlic festival with all our friends this next weekend. We are having a garlic festival with all our friends this next weekend. Sounds like a perfect opportunity for trading. Trade and plant this Fall. DoubleDogFarm wrote: They look really good James. I have forgotten what variety youi grow. Maybe they no longer have a name if saved from year to year. 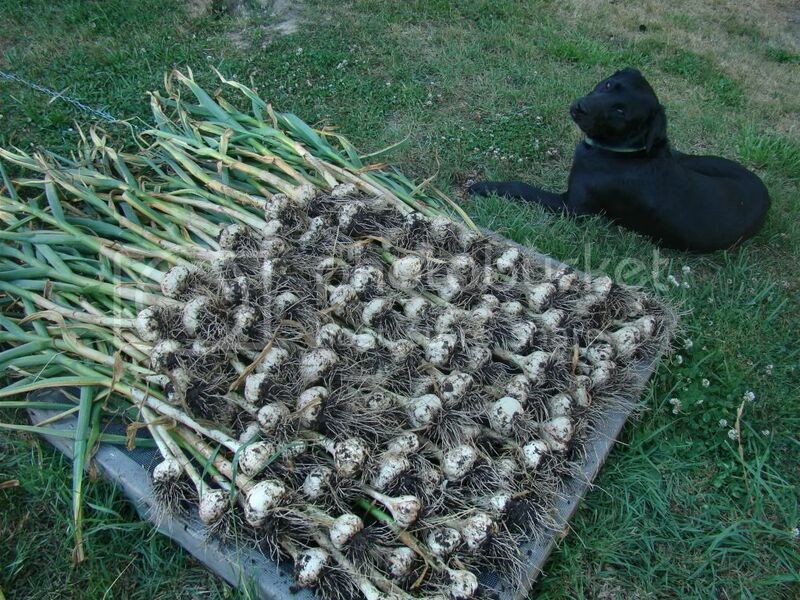 I received "0" posts on my garlic harvest. Hope you don't mind that I add a picture here. Very nice haul! However, our dog looks very unimpressed.